Compact bucket w/Squeeze Wringer This 24 qt. compact, lightweight bucket and sidepress wringer combo are perfect for small jobs accommodates up to 20 oz mops, and fits into tight spaces for convenient storage. 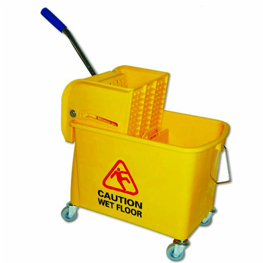 Includes 2" non-marking casters and has a removable divider insert that allows clean and dirty water to be separated. Sides of bucket show large PICTORIAL CAUTION SIGN.